“Dark Horse” is an inspirational and life-affirming rags-to-riches true story of a barmaid who bred a champion racehorse and changed lives. 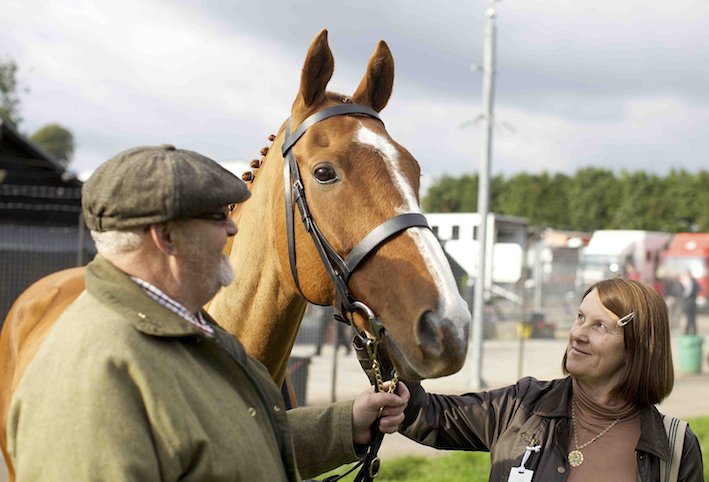 Set in a former mining valley in Wales, “Dark Horse” is the inspirational true story of a group of friends from a working men’s club who decide to take on the elite “sport of kings” and breed themselves a racehorse. Raised on a tiny patch of land, their foal grows into an unlikely champion, beating the finest thoroughbreds in the land, before suffering a near fatal accident. Nursed back to health by the love of his owners – for whom he’s become a source of inspiration and hope – he makes a remarkable recovery, returning to the track for a heart-stopping comeback. It’s about a community that had lost everything, who felt forgotten by the world; it’s about the irrepressible spirit of a barmaid Jan, who bred the racehorse, who and persuaded others to share her outlandish dream; it’s about a defiant and exuberant journey into an elite and exclusive world and the pride it gave the village to prove themselves the equal of anyone there. Above all, it’s about the extraordinary bond the characters forged with a beautiful animal that seemed almost like something from a fable; a phoenix rising from the ashes. I started out as a journalist in news, which was a great and exciting life, but I realized I kept wanting to stay behind in the aftermath of every story, as that’s when it seemed to me the really interesting things happened. I moved into documentaries and found a place I felt I was meant to be – it’s a job I love. Bringing alive for the big screen a story that existed only in a handful of photographs, a few tapes of home movie and some racing archive – that was definitely the challenge that kept me up at night. Judith (the producer) and I knew we wanted to make the film in the valley, in the village itself, so we asked the local community to help us and they couldn’t have been more welcoming or helpful. No professional extras were used – it’s all local people and animals. It made for an eventful and often comical shoot but those are memories that will stay with me forever (in a good way). The valley the film is set in had suffered really hard times. The people there had been powerless in the face of the mine closures that devastated their community. For a time I think that got into the soul of the place: they felt cast off and useless, they didn’t exist for the outside world. Jan responded to this by coming up with an idea that was so crazily ambitious and improbable: I’m going to breed a racehorse in my back garden. What? She wasn’t asking anyone’s permission, she wasn’t going to let anyone define her or her dreams. No one gave her a cat’s chance in hell but she did it and in doing it she ignited something in the people around her. “It brought the place back to life” as one of the contributors says. So what I hope people will take from the film is this: your circumstances, however tough or bleak, do not define you. What you do is who you are. A beautiful story set in the last great wilderness and fingers crossed, the funny and moving story of an unlikely rebellion. We shot 95% of the film on the Arri Alexa. We did some additional shoot days of the racehorse and a foal on the Sony F55. One or two shots were also filmed on my Pocket Black Magic. I carried it with me all the time as the weather in those Welsh valleys can be very dramatic. The film started life in the British Film Institute’s public pitch session for theatrical documentaries at Sheffield International Documentary Festival in 2013. We were lucky enough to be one of the films supported by the panel. And then, a commissioning editor I’d worked for at Channel 4 came in, then Film 4, and between them, they matched the BFI’s funds and we got to our budget.